Mead is fermented wine-like drink made of honey. I’ve had it once before, at a friend’s birthday party some years ago, and all I remember is how deliciously sweet it was. I’d never seen it for sale anywhere, until the weekend recently when I went up to the Blue Mountains and happened on a wine shop in Katoomba. Of course I had to buy some. Checking the company’s website when I got home, I discovered that they make three types of mead: honey mead, spiced mead, and liqueur mead. The only one I saw in the shop was the spiced mead, so that’s what we’re trying first. I plan to give the company’s distributor a call and see where I can find a place locally that sells the other two varieties. 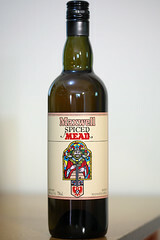 Anyway, the spiced mead comes with a recommendation on the bottle that it be served hot, at around 70°C. Just the perfect thing for relaxing on a cold winter’s evening, snuggled under a blanket in front of the TV. So for my first taste, I heated up a mug of the golden liquid in the microwave, taking care not to boil it. Sounds like some sort of sacrilege for wine, but then this is no ordinary wine. When hot, the aroma drifts about and fills the room with Christmassy smells of spiced puddings. Unfortunately it makes it hard to get a close sniff of the aroma, since it immediately makes you choke with the alcohol fumes. The taste is warm and sweet, with a bit of a tang, like a hot honey and lemon toddy with a good hit of brandy. That was about as much as I got from the hot version. Later I tried a glass at room temperature. This was much nicer. The colour is rich and deep, a golden amber that just looks gorgeous in the glass. It is thick and sticks to the inside of the glass when swirled. It’s beautiful just to look at this stuff. The aroma is strong and heady, reminiscent of fruitcake, rich with brandy and spices – the cinnamon and cloves added to make it spiced come through firmly, but not overpoweringly. The taste is like raisins, sweet and delicious, before the spice begins to dominate. There’s a tang, a little like orange marmalade, spiced with those cloves, and it lingers on the back of the tongue. It’s nice, but I really want to try the non-spiced version, and especially the liqueur version. I suspect I’ll like those even more. This entry was posted on Monday, 21 June, 2010 at 21:15	and is filed under Wine. You can follow any responses to this entry through the RSS 2.0 feed. You can skip to the end and leave a response. Pinging is currently not allowed. You know, the place I’ve worked at for the past two and a half years has always had this but I’ve never thought to try it. I might have to take some home with me tomorrow, after this. Tasmanian winter nights call for all the internal warming I can get. I like that you have a smell of Christmas. I do too, and it’s likely the same, but I hardly have a smell of New Years, or Labour Day. The best mead I’ve ever tried is Lindesfarne Mead, which, oddly enough, is actually best served chilled rather than warmed.